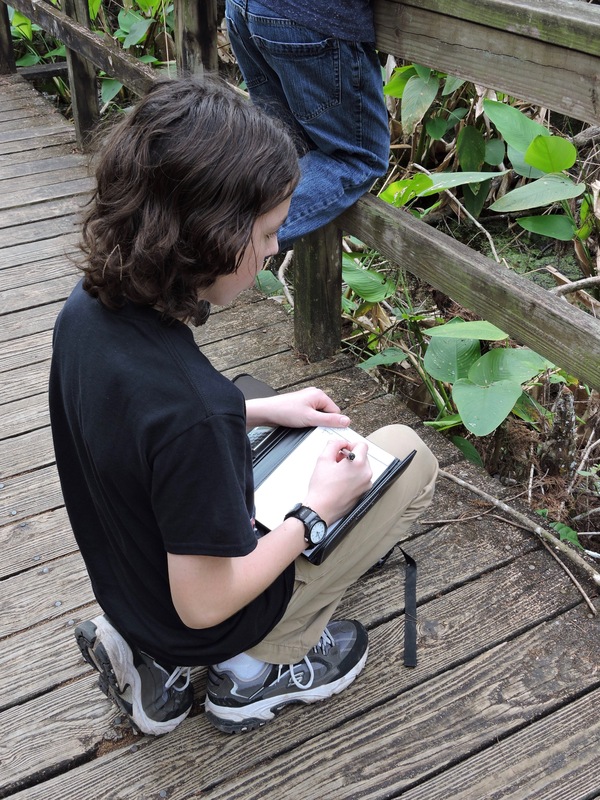 We ventured down to the Fakahatchee Strand Preserve State Park on the occasion of my boy’s 13th birthday. After all, a field herping adventure was on his wish list so who am I to deny the boy his wish? 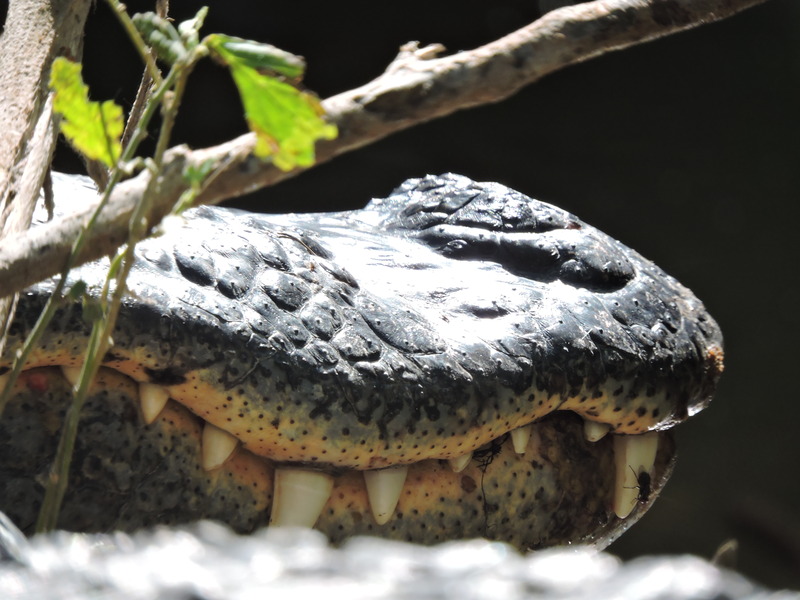 The boys and I rose at 4am (for some reason, hubby and the girls had zero interest in participating in this particular adventure) and made our way down to the Florida Everglades. 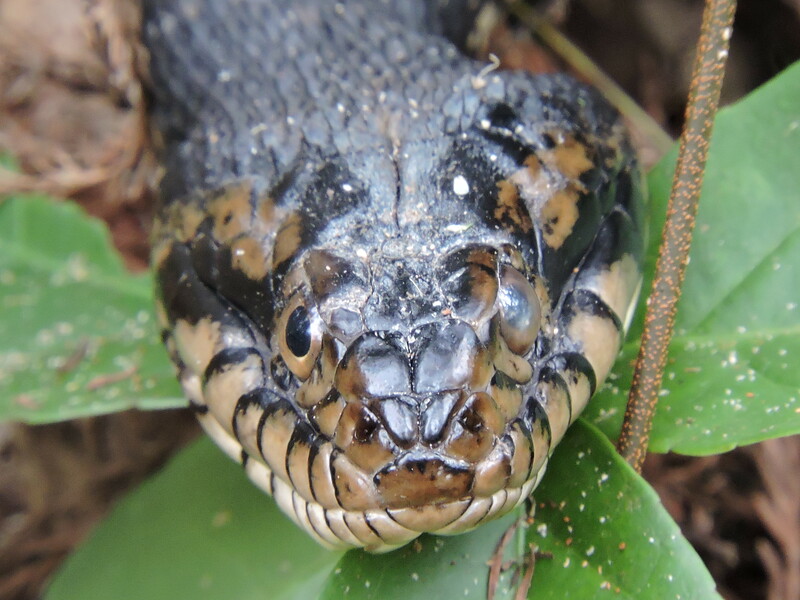 What better place could there be for spotting snakes than a huge swamp forest? 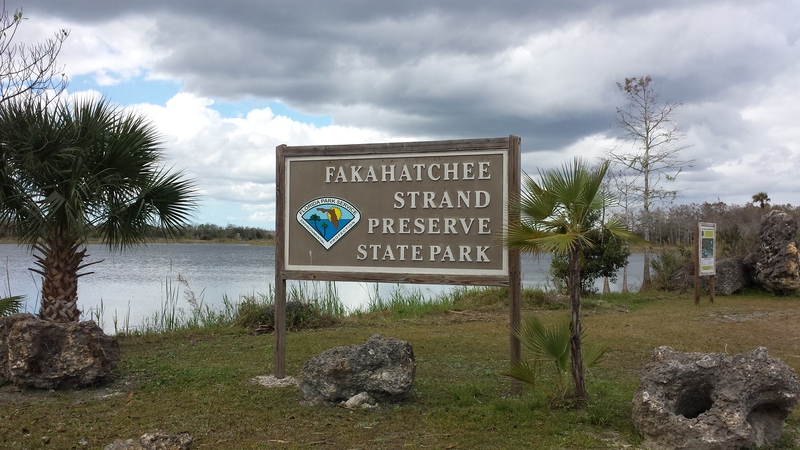 A few hours later, we were driving (slowly) along the bumpy 11-mile-long gravel/dirt road of Jane’s Scenic Drive in the Fakahatchee – the largest and least developed state park in Florida. It was slow going but at last we reached the trail head for the East Tram Line. This area was logged from 1944 to 1954, so thousands of centuries-old cypress trees were moved out on these tram roads. A few of these remain open for park maintenance and hiking purposes, for those who want to venture into this unique ecosystem. 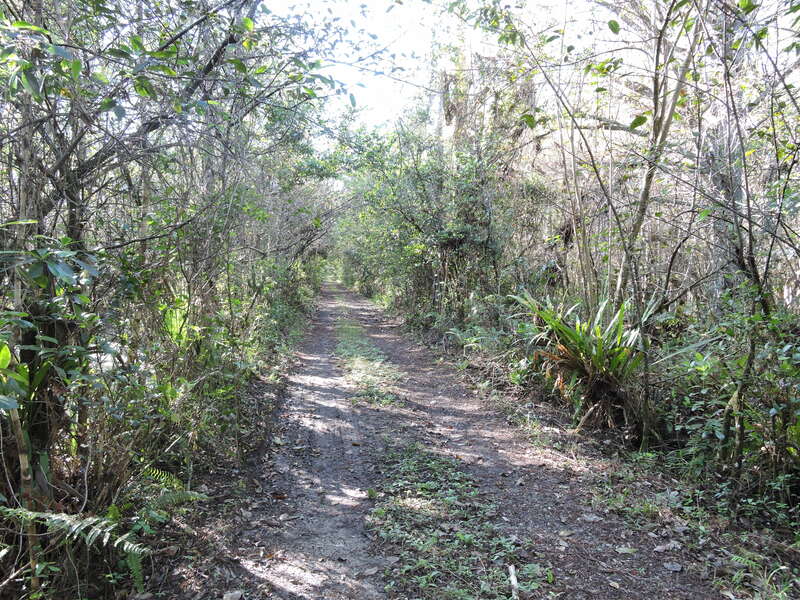 This is a place where deer, bear and panthers roam, so you never know what you might run into on the trail. Our car was the only one there so we were on our own. Gulp. We checked we had our bug repellant, water, snacks, and walking sticks in case we happened to encounter a gator on the trail, plus we set RunKeeper on my phone so we’d know how far we had walked. We were ready to go! Snakes, beware! Of course, there’s more to see here than reptiles. Nicknamed the “Orchid Swamp,” the Fakahatchee is home to 47 species of these exotic flowers, including the ghost orchid. There is actually an orchid poaching problem down here which is being battled with cameras nestled deep in the woods. Who knew? It seems like these flowers are well worth looking for but alas, we were not there for flora admiration purposes. We were there for snakes. On we walked. 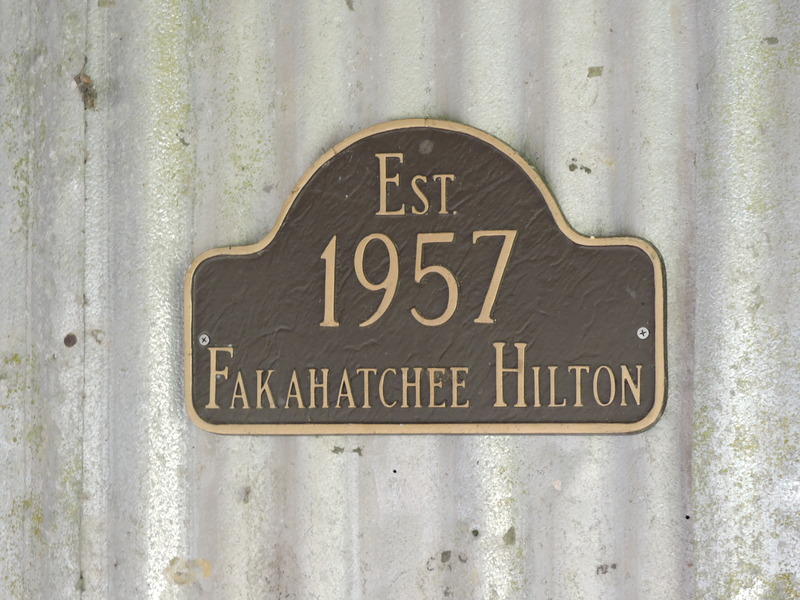 We eventually reached the Fakahatchee Hilton which is essentially a rustic cabin with a nice placard. The very kind owner happened to be there with his dog to do some work and he invited us to explore the boardwalk over the pond behind his family’s place. 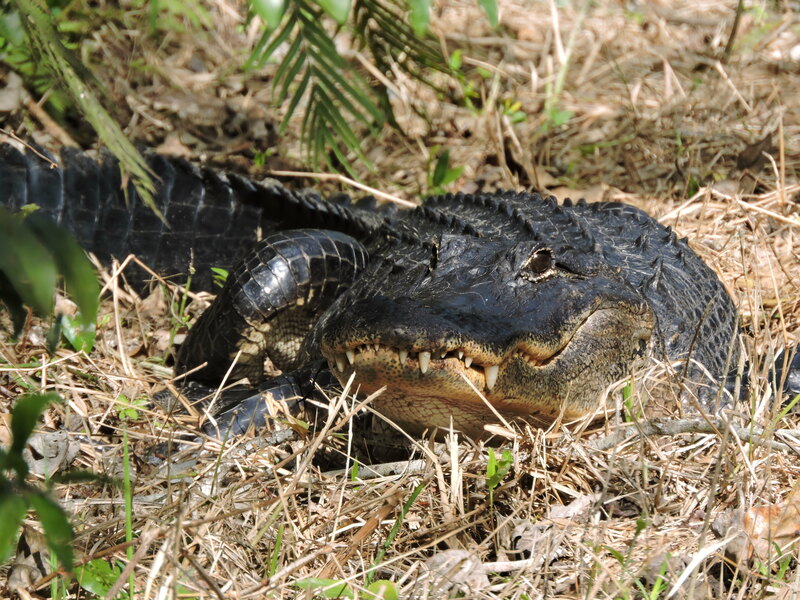 This pond was filled with alligators and was quite a sight to see! 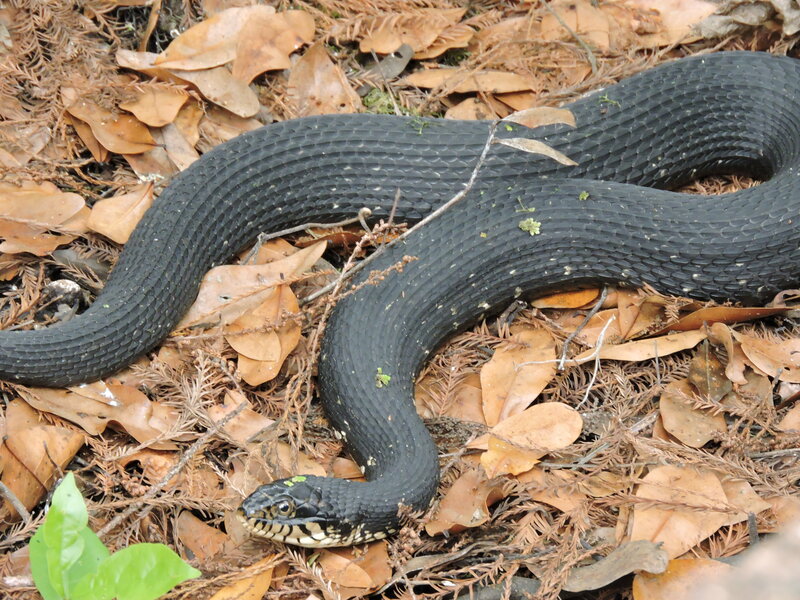 While our hike had been a lot of fun, our efforts to find snakes had been underwhelming so we decided to head to the nearby Big Cypress Bend Boardwalk along U.S. 41 which is maintained by The Friends of Fakahatchee. 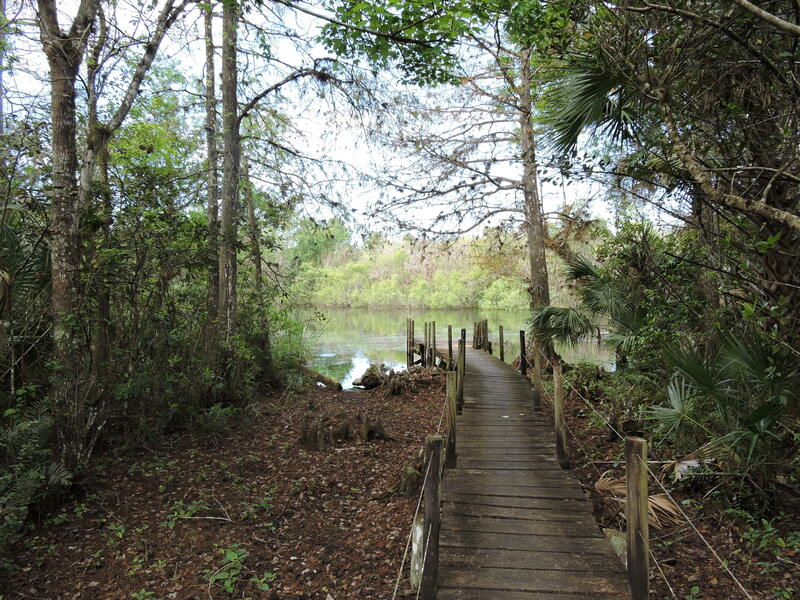 I always enjoy a boardwalk and this 2,300-foot wooden boardwalk took us into the heart of Fakahatchee Strand, the largest bald cypress/royal palm swamp in the world. The bald cypress trees surrounding the boardwalk are hundreds of years old. Amazing! 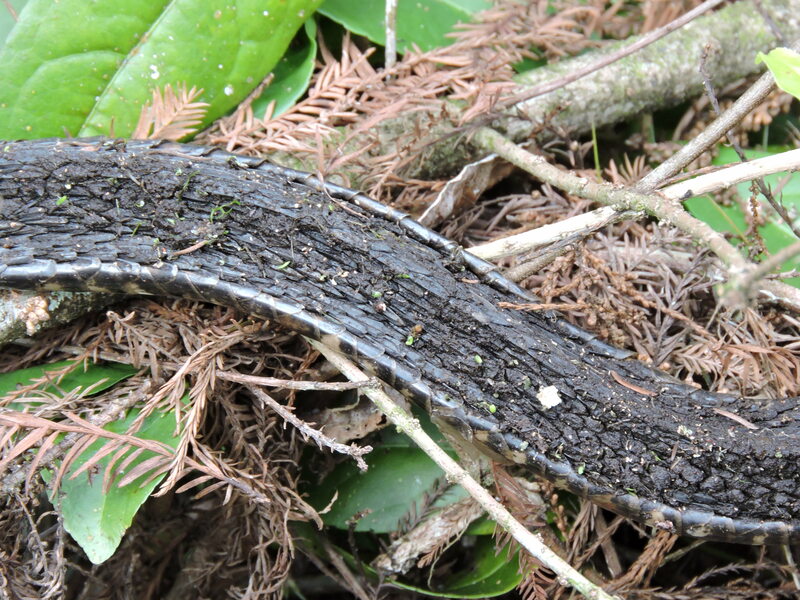 Dozens of signs help identify the flora but my boys reminded me we were there for snakes. We also noticed one who may have recently shed and had a retained eye cap on one eye. We didn’t offer to remove it for him. Sadly we did see one who appeared to be quite sick. Disease or parasites, we guess. Poor guy. SnakeBoy was busy taking field notes. He just could not believe our luck! He was happy to also share some knowledge about the snakes with other visitors. 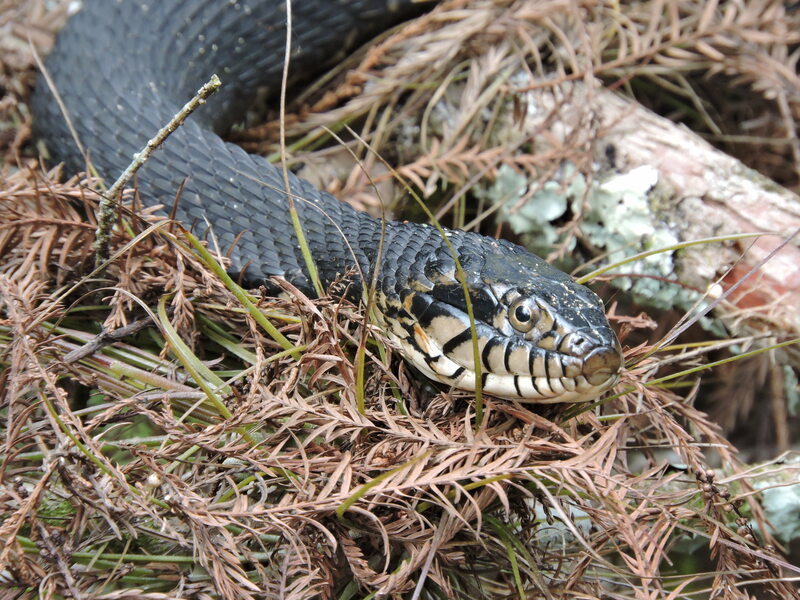 I’ve got to hand it to him: he regularly encounters adults who are surely well-intentioned but often misinformed about snakes, and he’s patient (even though I sense his inner exasperation sometimes when they warn him about those “poisonous” snakes). They usually soon figure out that he has a pretty solid grasp of what he’s talking about. It’s very nice when they acknowledge that. So our adventure to the Fakahatchee was deemed a success and the birthday boy was happy. Hooray! 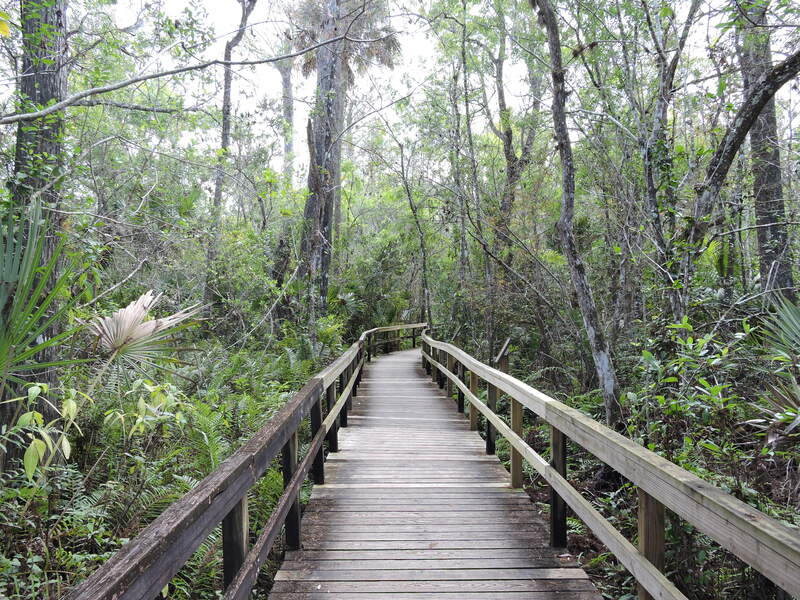 Once we left the Boardwalk, we stopped by a nearby Subway to pick up a late lunch (which was prepared at remarkably glacial speed) before we headed back north toward the Corkscrew Swamp Sanctuary. 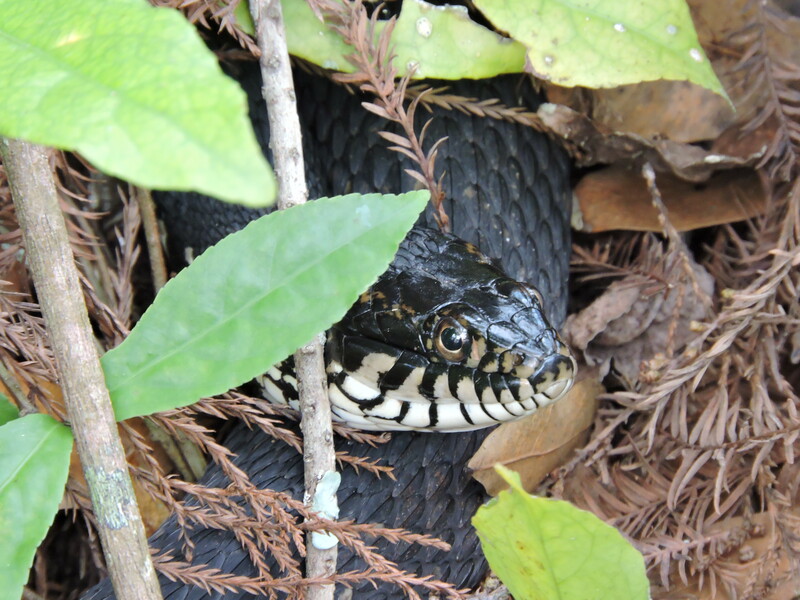 Check out our post on that beautiful Audubon Center to see which snakes (and other wildlife!) we discovered there.